Why is the periodicity of fields in finite temperature QCD consequence of Trace in the action? What's the difference between quantum mechanical operator $\Phi^r(x)$ and its corresponding quantum fields $\phi^r(x)$ ? The difference between projection operators and field operators in QFT? What is the relationship between string net theory and string / M-theory? Difference between the Rarita-Scwinger field and the gravitino? What's the difference between energy and temperature in field theory? I'm familiar with the formalisms for both zero temperature and finite temperature field theory, but (somewhat embarrassingly) I don't actually have a good physical intuition for when physical scenarios call for one set of methods vs. the other. For instance, at say the LHC it's my impression that despite the huge energies involved during collisions, zero temperature field theory is appropriate for all relevant calculations. One the other hand (I could certainly be wrong here, again), it's my impression that heavy ion collisions such as those performed at RHIC are suited to finite temperature calculations instead. 1) Generically, how does one know when to use finite vs. zero temperature field theory? 2) Can one a priori determine whether finite temperature corrections will be important? 3) If my impression are correct about the LHC and RHIC, is there a quick, back-of-the-envelope calculation which demonstrates that zero temperature and finite temperature field theory should be used in these two scenarios, respectively? You have to check if the temperature is small compared to the chemical potential. In heavy ion collisions, the chemical potential is rather low but the temperature is very high, so one have to stick with thermal field theory. In compact stars the densities and therefore the chemical potential is at the MeV scale whereas the temperature is at the keV scale so one consider them as "cold" and uses the T=0 approximation. You can see that you find heavy ion collision at the mu=0 axis at high temps, but neutron stars close to the T=0 axis. Thank you for the response. Can you elaborate on why the chemical potential is what T ought to be compared to? I don't often think about the chemical potential and don't have a great sense for it, unfortunately. And as for the LHC, is it obvious what the scale of the chemical potential is in this scenario? I am very ignorant here, but.. Surely the question is whether you want to do statistical mechanics or not. Finite temperatures will allow you to ignore the energy sources - but still enable you to calculate the production of particles. I don't see how you would ever use it for scattering problems involving small numbers of particles. On Noldig's answer: In condensed matter, the chemical potential at zero temperature is also called the Fermi energy - the boundary between filled and unfilled states. When this is larger than the temperature, the matter is cold, with most particles effectively in their ground state, with the total energy dominated by the zero-point energy. For example, in a white dwarf the electrons are cold in this sense, but are not very interesting from a field theory perspective. 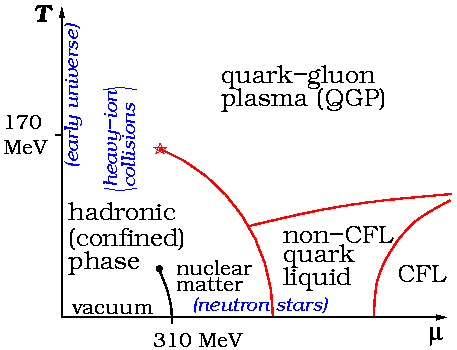 When a neutron star is formed, the Fermi energy of the hadrons (quarks?) can be higher than the thermal energy, as Noldig suggests. Particle creation/destruction in this situation would operate at T=0. The most obvious example of finite temperature is surely good old-fashioned black-body radiation.